Adopted a horse from us? Send us an update and some photos so we can share! Personality: Strong willed…but she tries her heart out! Sassy Lass is bold, beautiful proof that when it comes to reinventing off-the-track thoroughbreds, patience pays big returns. Sassy’s new “mom ,” Molly S., knows this firsthand. Molly met Sassy -- then a fiery, dark bay, five year old -- in 2014, when Akindale Thoroughbred Rescue sent Sassy to train with Molly’s mother (who has a passion for “recreating” off-the-track thoroughbreds). Molly’s first ride on Sassy left an impression, to say the least. She recalls, “Sassy promptly dumped me and galloped off. 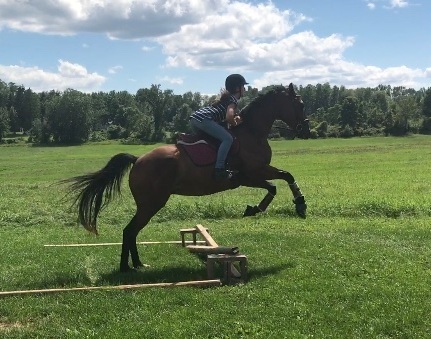 We couldn’t catch her for 10 minutes.” Rather than be put off by Sassy’s antics, Molly and her mom were taken by the mare’s spirit and the way she cracked her back, which they knew meant real jumping potential. Despite the challenges that come with young horses, Molly was drawn to Sassy. 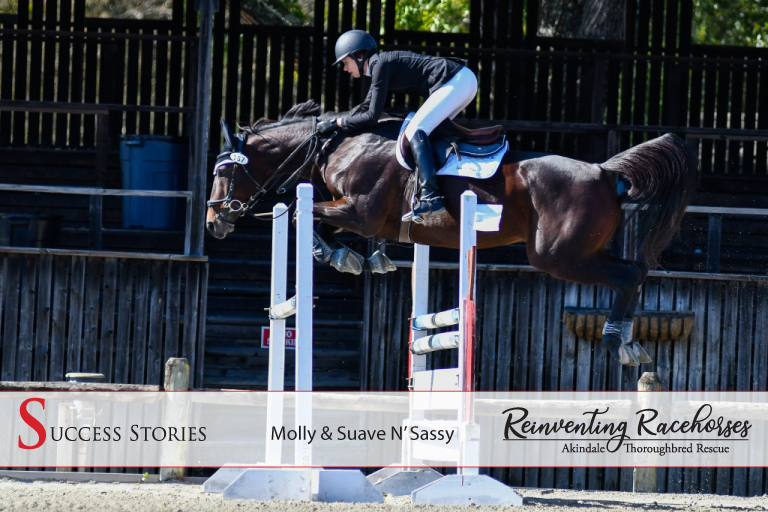 So much so that a potentially fatal pasture injury requiring six months of intensive and meticulous rehab only confirmed to Molly that Sassy was her “heart horse.” Molly officially adopted Sassy from Akindale’s unique Reinventing Racehorses 5R’s program in 2015. Bringing Sassy back into training post-rehab presented another challenge. Says Molly, “Sassy initially hated flatwork; she was strong and spooky in the ring.” Fortunately, Molly had learned a thing or two about clever solutions during her childhood with a talented but tempestuous 12.2 hand Welsh pony, Lambchop. So, rather than trying to force Sassy to contain herself in the ring, Molly opted to train her on the trails and cross country, occasionally following her mom and Sassy’s “boyfriend,” a gelding named Rooster, on hunter paces. Once Molly had Sassy jumping positive and forward in the fields, she took her back to the ring and continued training step by step. In 2017, the pair found their stride in the three foot child/adult jumpers. By fall 2018, they were competitive at 1.10m at AA shows like Swan Lake, Culpepper and Lexington. Now, after a winter break, Molly’s goal with Sassy is to “get our wings under our belt this year,” stepping up to the 1.15m division. Betsy DeVault came across a photo of a sweet-looking bay thoroughbred named Callmetony while browsing an equestrian Facebook group in the fall of 2017. Her interest piqued, she traced the photo to the Akindale Thoroughbred Rescue website, and from there to Akindale’s South Carolina satellite facility. Speaking to the Akindale trainer, Heather, she learned that Tony was engaged in the rescue’s Reinventing Racehorses 5R’s program, training for a new life. With daughter Belle having recently outgrown her Arabian pony, Betsy drove her to meet Tony, who not only looked sweet, but proved to be a cinch to bring in from the field, quiet on the crossties, easy to groom and tack up, and not too difficult to ride with some coaching. Even so, Belle’s trainer wasn’t convinced when she heard about Tony, concerned that her relatively inexperienced 13-year-old student wasn’t ready for a thoroughbred. So she returned with Betsy and Belle to see for herself and, after watching Belle and Tony in action, said she was willing to give the partnership a go. Betsy recalled, “It’s just like Belle and Tony chose each other. Afterwards in the car, Belle turned to me and said, ‘I need him.’” So within a few weeks they completed the adoption. Having raced until he was 11, then lived with a family who cared for him until health-related circumstances led them to return him to Akindale, Tony was starting a new life as a new best friend and potential children’s show hunter in a forever home. Early training came with the expected ups and downs. Belle started showing Tony in November 2017 and over the following months qualified for the Jockey Club Thoroughbred Incentive Program finals held at Kentucky Horse Park last September. At the finals, Tony flatted “like a champ,” placing fourth in a class of 24 amateurs and professionals. Unfortunately, the same day, he suffered an injury while distracted by busy surroundings in an over fences class, which required a few stitches and a few weeks off to heal. Not one to give up, Belle looked at the day as a learning experience and looked forward to getting back in the saddle. The pair returned to the ring a few weeks later, working hard to regain their confidence and strengthen their foundation. Before too long, they were champion in the long stirrup division at a local show. 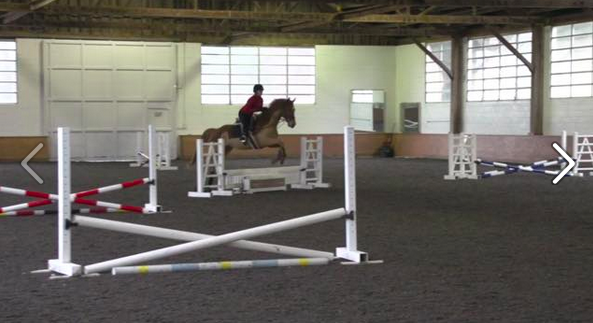 Then, at his first indoor show in Raleigh, NC, Tony pinned eighth in the Hunter Derby. 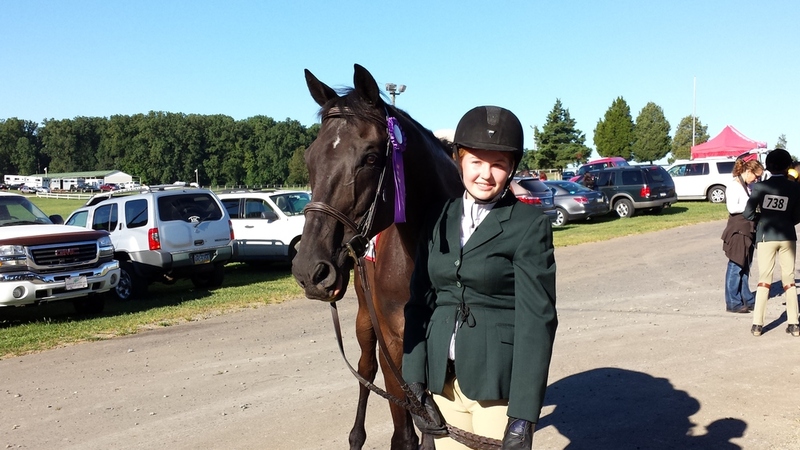 Belle also participates in the Interscholastic Equestrian Association horse show program with other middle- and high-school kids who compete on horses provided by the host team of each IEA show. Tony is a go-to flat horse when Belle’s team is hosting, due to his level temperament. And, given his good nature around little children, Belle is working to get him therapy certified. There will always be a stall waiting at Akindale in the Famous Retirees barn for Tony, but he clearly told us he wasn't ready to retire, until then we are exstatic he has a loving family and is flourishing with his family. Personality: Quirky, confident, sweet, easygoing – a character! Scooby Dude is well bred – his sire Presently Perfect won the Dubai Cup. Scooby inherited his dad’s beautiful bay looks but, unfortunately, not his speed. So in 2015 at just three years old, Scooby was out of a job and facing an uncertain future. He arrived at Akindale Thoroughbred Rescue’s Aiken, SC, satellite the same fall, very much in need of rest and rehabilitation -- the first two steps in Akindale’s unique Reinventing Racehorses 5R’s program, that would lay a solid foundation for Scooby to make a fresh start. Not long into his retraining, Scooby found love around Valentine’s Day, when his soon-to-be new mom laid eyes on him. Reagan N. also arrived in Aiken from another life -- growing up in Alberta, Canada -- to spend the winter working and training with an established eventer. Having ridden since she could climb onto a horse with her mother, and recently outgrowing her trusty Training level event horse, Ace, Reagan was soon craving a new equine partner. So, with her mom’s help researching online, Reagan found her way to Akindale and Scooby Dude. Because Scooby was early on in his training when Reagan adopted him, he still had strength to build and weight to gain when she moved him to the farm where she worked. At first glance, Reagan’s employer/trainer thought that Novice level might be the extent of Scooby’s potential, particularly given his aversion to even the smallest ditch-like dip in terrain. But by the time Reagan took Scooby home to Alberta for the summer a few months later, he was healthy, happy and starting to show a whole new side of himself – fearless and fresh. 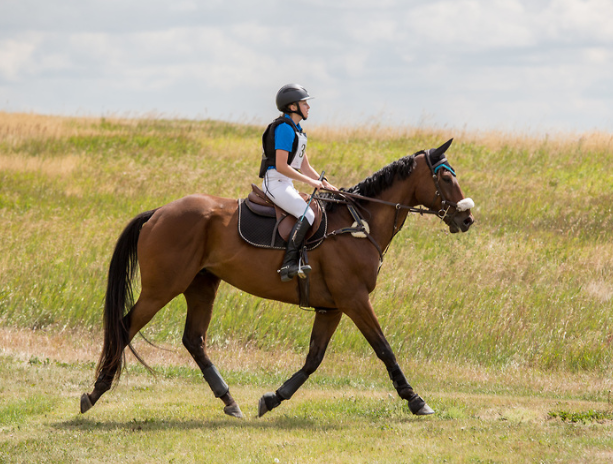 Scooby made an impressive debut as an eventer that summer of 2016, winning at the Beginner Novice level, including the dressage phase for which warmblood types are often preferred. Summer of 2017 brought not only consistent success at Novice level, but winning First level dressage tests and competing at jumper shows. Scooby’s progress in 2017 was better than Reagan anticipated, but their success in 2018 was a dream come true. In Ocala for the winter to work and train, Reagan and Scooby stepped up to Training level. 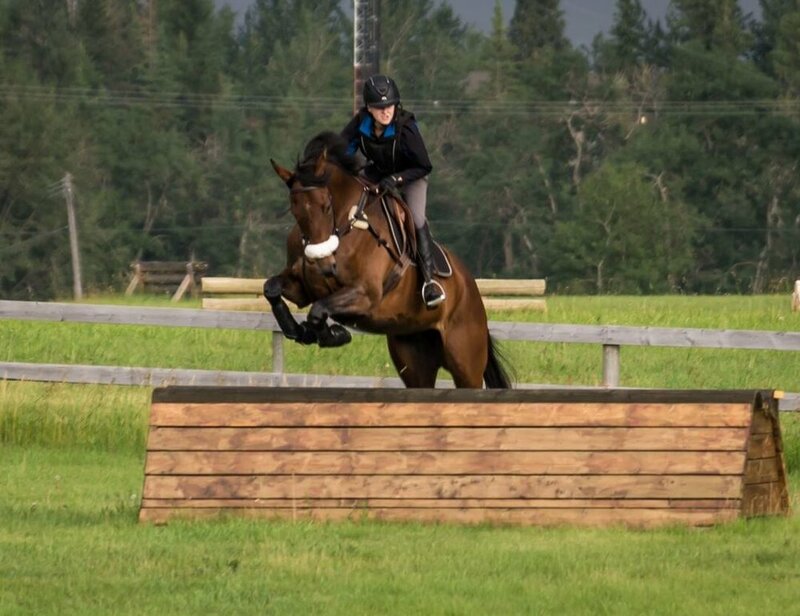 That summer they stepped up again, to Preliminary in Alberta -- a first for both rider and horse, including a personal best dressage score. 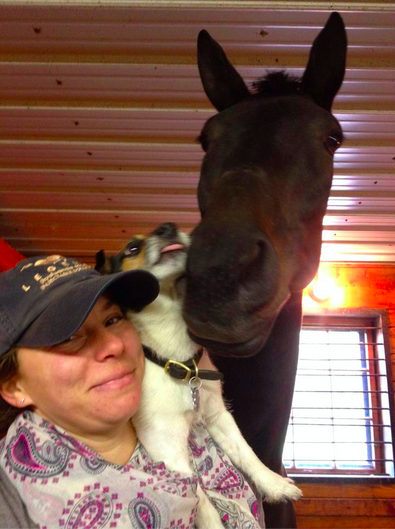 New Career: Hunter/Jumper, Pleasure Horse, all around Good Boy! Story written by his loving owner, Kimberly: Hidden Hand had come to Akindale in the Summer of 2014. His owners, Zayat Stables, decided to retire him after he incurred a hip injury. He had had some time off, was let down and enjoyed some time being a horse at ATBR. 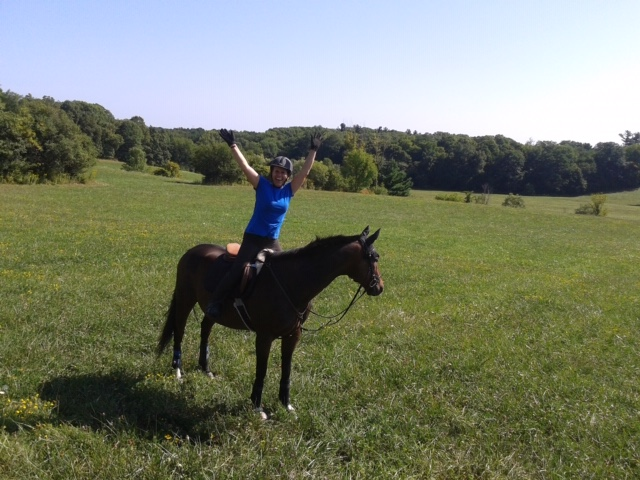 In the Summer of 2015 I made the decision to start my search for another horse and I knew it had to be an OTTB! During his time there, Heather was going to bring him down to SC with her, but that never happened. As fate has it, I contacted Akindale, filled out my application and a week later was going to meet and try 3 horses. I walked into the barn at Akindale, met the first 2 horses and then I met Hidden Hand. I walked into his stall, he looked at me, I looked at him and said "this is him!" I knew he would be coming home with me and at that point I didn’t even care how he rode! I did try him that day and he had a few issues to work out but nothing we couldn’t handle. The next week, I hooked up the trailer and I went to bring him home. He came with a verrrry long list of upkeep! and it took us almost 2 hours to load him on the trailer! BUT it didn’t matter because we were meant to be. Fast forward almost 4 years later and Revel is excelling in every possible way. Him and my 13 yo daughter (Jenna) struck up a very special bond and have been inseparable ever since. They will be ready to enter the show ring together this Spring trying out the Jumpers. He is a wonderful pleasure horse, unflappable trail horse and smarter than average..... and he knows it! Revel has also given a few therapeutic lessons and was a complete gentleman! Revel lives in Wallkill, NY with his best friend and little brother, a Shetland Pony named Niles. 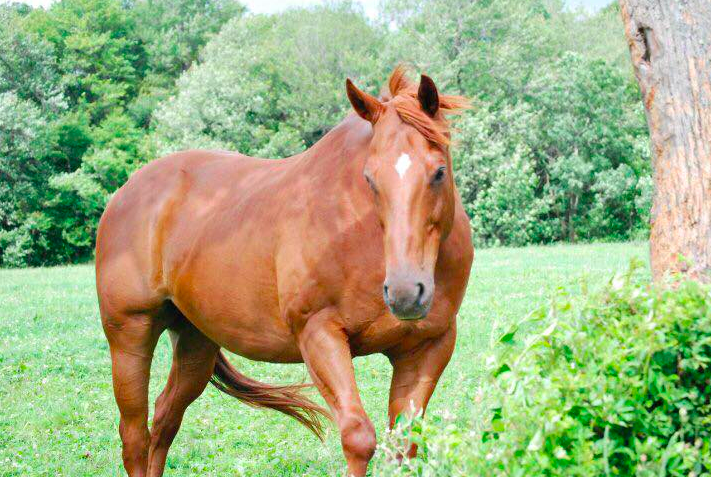 Chris W believes that finding Ranger, the Thoroughbred of her dreams, was fate. It had been several years since she’d lost her beloved first horse, a 14.2 hand Arabian purchased from her barn’s lesson program, at the ripe old age of 27. Feeling ready for her next horse, Chris debated between another Arabian and a thoroughbred rescue. 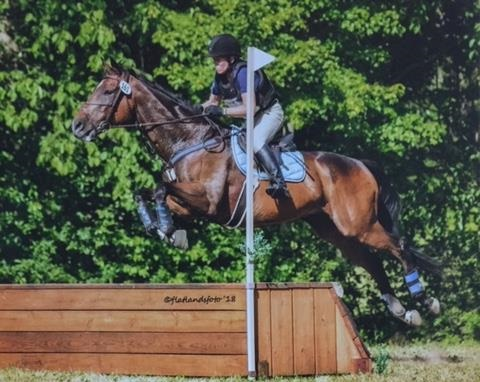 When she asked her trainer and a few friends for advice, all encouraged her to go with the rescue, as they felt a thoroughbred’s versatility would provide Chris more options for her next equestrian adventure. Not long after, Chris learned that her barn would be having a charity horse show to benefit Akindale Farm, and that Akindale would be bringing a few adoption candidates to compete. Laud Lazarus never left the horse show. And Chris never looked back. Chris wasn’t sure what she wanted to pursue with Laud Lazarus (whom Chris, a hockey fan, nicknamed Ranger) once he settled in, but was itching to try something new. She liked to trail ride and had enjoyed competing at the occasional hunter/jumper show. She appreciated the basics of dressage she was learning while working with Ranger on his leads, but still loved to jump. 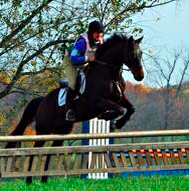 So, she decided to try eventing…and fell in love. The rest, as they say, is happy history. When asked her favorite thing to do with Ranger, Chris gushes, “Everything! I can be competitive at local events. I can go for a trail ride by myself. I have fun caring for him at the barn.” And she loves Ranger’s favorite trick – curling his lip and showing his teeth in a horsey grin. Does Chris recommend Akindale thoroughbred adoptions? “Absolutely. It’s great to see these horses have a second job. They have so much to offer” and can be had by qualified candidates for not much more than the price of vetting. "Three years ago we adopted Helen's Lady, aka "Rosemary." We were looking for a quiet horse for our children and she is exactly what we were looking for. 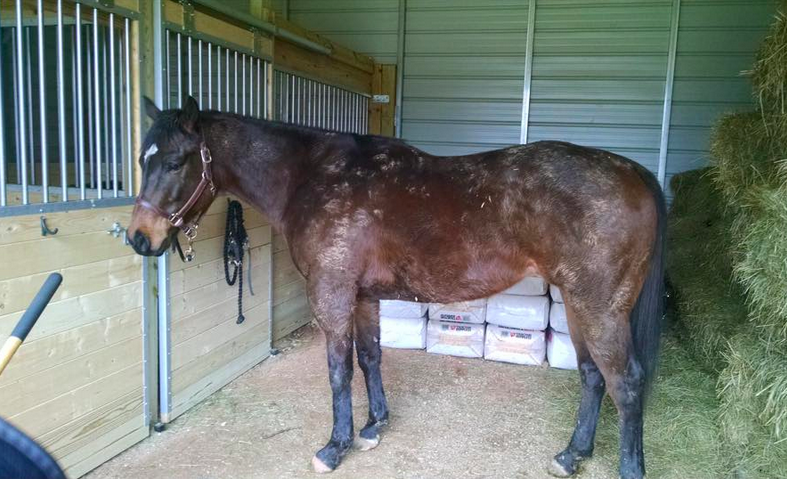 She is a sweet, in your pocket type of mare. Rosemary has gone to gymkhanas and some local horse shows and she has been a star, trotting around barrels and weave poles like she had done it a hundred times before. We couldn't ask for a better family horse!" The photographer is Monika Rohfeld. If BullyBullyBully looks familiar, it's because he was on the Animal Planet show Jockeys back in 2009. Trained by Kristin Mulhall and ridden by Chantal Sutherland, who both loved him and didn't want to give him up, he was claimed and began the precarious drop through the claiming ranks. He ended up at Mountaineer Park where he was running for $5,000. He finished last by 39 1/2 lengths. He arrived to us in the beginning of June 2013, the first day Heather got on him she loved him. He was smart and willing. His ankles limit him to light riding but that's good enough for his adopter Monique. He lives with her other older gelding and has the life he deserves. This picture is this summer sent to us by Monique. "He's doing great. 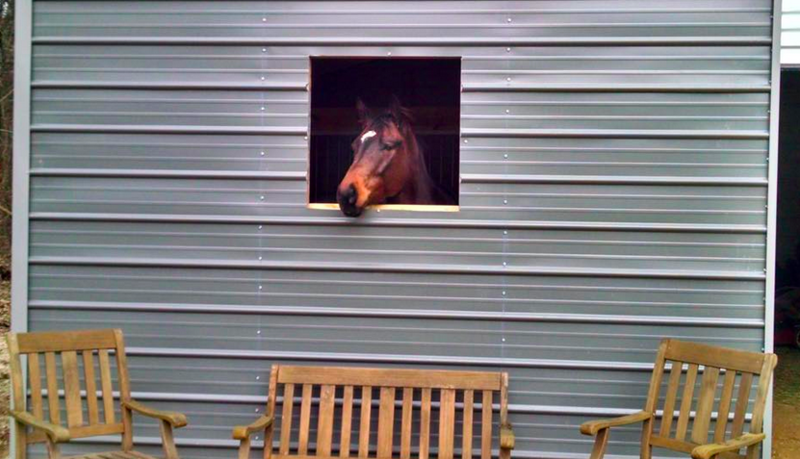 Since we last spoke, I actually bought a house with a barn just for him! Show barns just don't have the kind of care and attention that he needs and deserves. He has now all day grass in and out turnout, unlimited hay, and I got him his very own mini horse that he loves. And the plus is that I get to see him every minute of the day!! I can say he's truly happy here, and he whinnys to me all throughout the day to let me know he wants a refill on his hay. He also doesn't get ridden as seriously as we were doing at the other barns so he's super happy. What he needed was a stress free life and I think he now has it. Unfortunately last month he had his third colic surgery. He used to colic almost once a month at other barns so since we moved here two years ago he didn't have a single episode. Until May 1st, but I'm willing to do anything for him so he recovered great, and is back to himself now. He's really a trooper." Indiscernible, aka Willie, is doing great and recently completed his first recognized novice event with no jumping faults. Way to go Willie! And thank you so much, Ann, for the update. He looks amazing and happy! September was adopted last fall and has been a superstar. Truth is we didn't expect anything less from this guy! He had an amazing owner who always had his best interest at heart. His farm has a Facebook page that you can follow to see him from time to time. 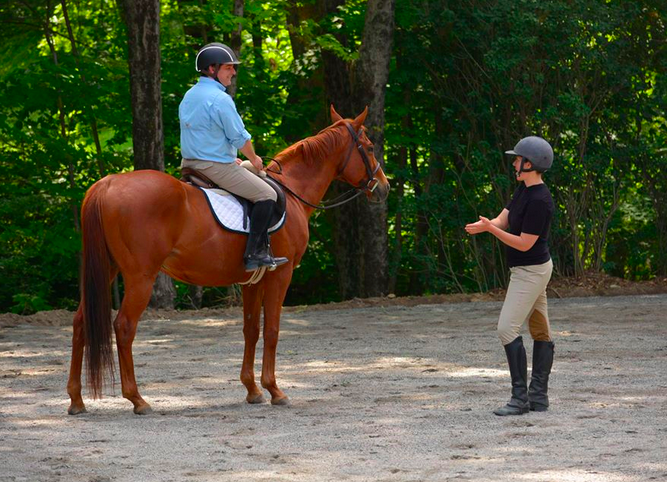 "Quick and I had our first lesson with my trainer, two-time-Olympian, Lendon Gray, today! He is an awesome horse! He has mended all of our hearts after the loss of a beloved horse. And he is a sweetheart and companion to my 26-year-old blind horse! I believe that Quick is the horse that I have always dreamed of… He is smart, he is willing, he is safe, and he is beautiful! 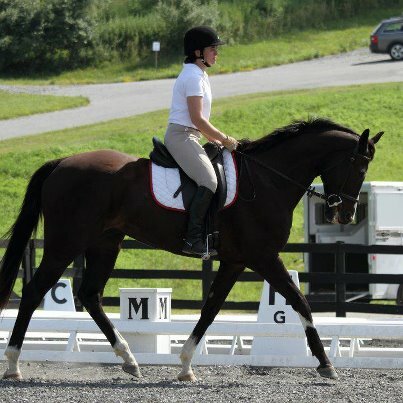 Lendon thought he was not only a sweet guy, but also a really nice dressage horse! 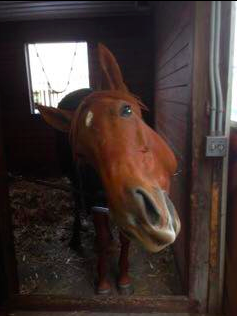 I am also so grateful for Akindale suggesting that we adopt our totally fabulous pony, Cinnamon! Everyone loves her beyond belief and I have started working with her on long lines to teach her to drive to give her a little job! I have the horses at home and it is an honor to care for them, to have the opportunity to really have a deep relationship with them by not only enjoying riding, but by truly being their caretaker and the source of their love and entertainment! They are absolutely a delight each and every day! So very grateful! "Sheila is a very special horse. Actually, to me she is one of the most special horses at the barn. Sheila is also very goofy, she is one fun horse to play around with but she does have her sassy mare moments. She is a joy to watch, her gaits are gorgeous, you can't not stop to watch her. Although she gets excited at times, she loves to jump. She has gotten pretty good at it too! Sheila is truly a one of a kind horse and I could not imagine my life without her. She has come such a long way and I could not be more proud of her." Sheila even has her own Facebook page under Sheila's Gold. Thank you, Heather, so much! We hope we can help fill your barn with many of our TBs! It was the year 2006 and in the fall. Winter was coming and the auctions were packed with horses. We saved 20 in one week and this handsome dude was one of them. Bank Me always reminded me of a Quarter Horse. He was so stocky, not your typical Thoroughbred. He was always overlooked and did have some trust issues. We were so patient with him and he learned to trust us and came around. It took us seven years to find the perfect family for Bank Me. And let me tell you patience was key in this story. It was a long wait but Bank Me hit the pot of gold at the end of the rainbow! He is so loved and gets spoiled every day. A day never goes by that he doesn't get his well deserved cookies and sometimes he even persuades Dawn into giving him a bucket of them. He rarely has to work and just lives his life as a pampered spoiled boy with his two brothers. Huge thanks to Lisa Molloy for finding his perfect family! Dawn Elisabeth Engen, we will forever be grateful to you for accepting Bank Me into your family and giving him the best life anyone could ask for. We thought it would only be appropriate to share our story of Hot West. His mother Xtra Heat is a Hall Of Fame Finalist for this year! Hot West aka Ivan was adopted out from Virginia Beach with Lisa Molloy. "Well, I had a Hanoverian-Thoroughbred cross, hunter jumper, in high school, and ever since then, I've wanted to have another horse. Never seems to get out of your system. My journey with Hot West began on Christmas of 2013. I was in the process of finding a property where I could have horses in Charlotte, North Carolina. I found my dream place and at the same time started searching for a horse. I came across Akindale and Lisa Malloy and contacted her. She was so great to work with and she told me about three horses I might be interested in. She told me about Hot West and how he was built like a "tank." I looked him up on the website, and couldn't believe how beautiful he was. So I drove up to Suffolk, Virginia soon after. We looked at the other two horses first and I just wasn't feeling it with them. Then we went and got Hot West out of his stall. He nearly took my breath away. I saw that kind eye he has, that gorgeous face and physique. He casually walked over to me and put his head under my arm and just stood there. It was as though he picked me out and I just knew he was the one. I was so excited. "Meanwhile, I was also purchasing that property and had him boarded close to my job so I could go see him after work. I renamed him Ivan. For the next year I worked hard on my place, fencing, putting in a barn, a run in shed, a round pen, a ring. And on Jan 2nd of this year, it was time to bring Ivan home. I had also bought a donkey named Floyd a couple months before so they could bond before moving them here. They became inseparable and are best friends. I designed the barn just for them and their stalls are side by side. "We're working with a trainer now with a goal of eventually fox hunting. We have a lot of work to do but I don't regret my decision a bit. Ivan and I are bonding too and it's so great to have him and Floyd at home. He's a magnificent horse. Many, many thanks to Akindale. 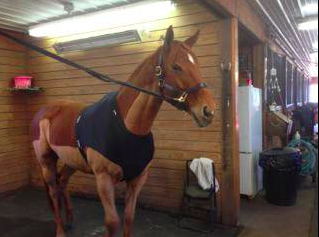 You guys provide a truly great service to horses and horse people!" What A Prospect out hunting in November with his friends!